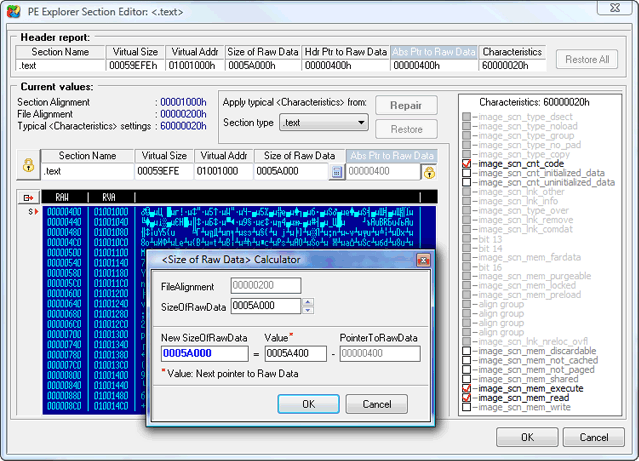 PE Explorer Section Editor: Restoring lost values of section offsets to real data in the file. I find it to be VERY useful tool for DLL viewing and editing. Was surprised how easy to use it is compared to other tools out there. The UI is very intuitive with lots of cool features. Really good work! PE Explorer enables you to view, extract, recalculate, or delete sections from the program body. You can change all the fields in the section header, or repair and restore the damaged section header settings. The Section Editor lets you edit section names and size, restore lost values, repair sections' haracteristics, browse a file image dump. The built-in calculator will help you calculate the Size of Raw Data value.